Replacing flammable liquid electrolytes with Ionic’s non-flammable solid polymer drastically improves battery safety and robustness, as Ionic has demonstrated in a number of safety tests. Numerous prospective customers and partners in a variety of different industries/applications have emphasized the value of improved battery safety, particularly given the recent spate of battery-related safety issues. Electric vehicle companies have indicated that improved cell-level safety may lead to performance improvements and cost reductions at the pack-level, particularly if they allow the elimination or simplification of cooling and battery management systems. Click here for more information about our safety characteristics. Ionic has demonstrated that its polymer electrolyte is compatible with chemistries that have much higher theoretical performance limits than the active materials used in current state-of-the-art batteries. 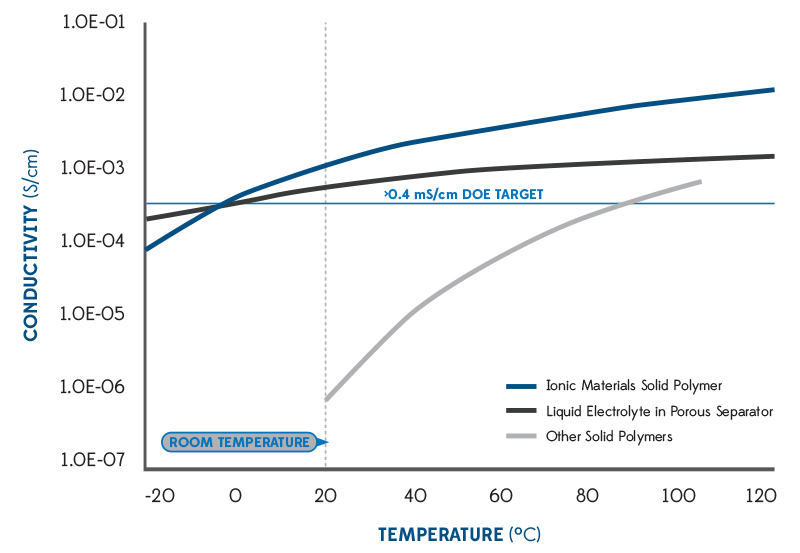 Higher energy density chemistries can now be developed and brought to market effectively. Ionic Materials is a true “platform technology” enabling the use of a wide range of electrode chemistries, including lithium metal anodes, sulfur cathodes, and more, resulting in much higher energy density and performance. Our polymer is compatible with a number of next generation chemistries that have the potential to significantly reduce battery costs per kWh (either because they use lower cost materials, because they enable much higher energy densities, or both). In addition, use of Ionic’s polymer as a battery electrolyte potentially enables the production of batteries using extrusion and other plastic processing techniques that are simpler and lower cost than the methods used to manufacture liquid electrolyte batteries.